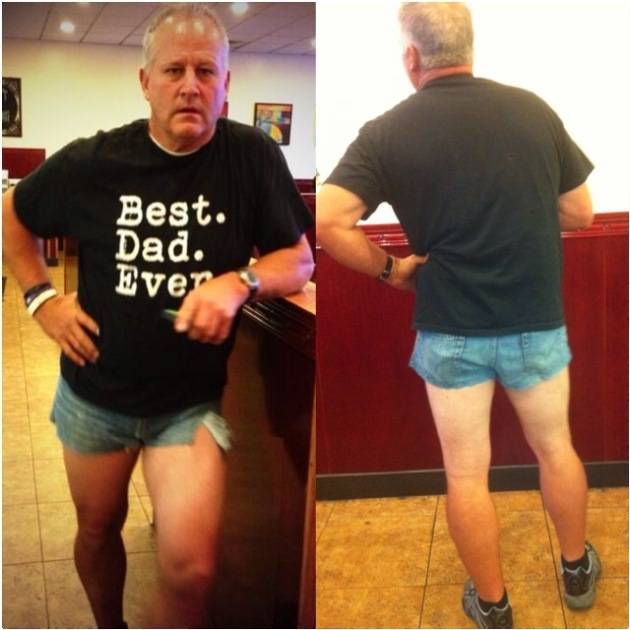 Read this story about a dad who wore short shorts to try to make a point to his daughter. What are your thoughts on this dad’s approach? I won’t throw stones at him, because I think he’s trying in love to help his daughter think through how she makes choices. Every parent has been in a similar situation, where we want to teach our child something, and they rebel. There are no easy answers. Here are some things for parents to think about when they find themselves in a similar position. These are focused on using parenting practices that provide warmth and closeness but also a degree of control and rule setting. 1. Be very careful about what you buy or allow in your home. If you don’t want them to wear it out, play it, listen to or watch it, then don’t buy it or allow your child to bring it into your home. 2. Don’t ask in these situations, give a calm but direct instruction, “That’s not appropriate to wear in public because people can see your behind when you sit down or lean over, you need to go change” or “That song is disrespectful to women, we won’t listen to it in our home.” Be sure to share your reasoning with your child. While they may not agree, this gives them opportunities to understand the reasons behind your rules. 3. Make it clear that this is your home and family and the adults ultimately make the decisions. Children are welcome and invited to disagree politely and discuss their perspective. But in the end, the parent makes the call. At our house, we often discuss decisions together, but if no is the final verdict, we point out that when they are adults they can make different choices. 4. Give your child clearly stated choices and follow through with the logical consequences. For example, in the situation above, “You can choose to change and go with us or not change and stay home (without any kind of mobile device or computer access).” This gives your child the chance to connect their actions with logical consequences and empowers them to make a choice of their own, knowing what the outcome will be. Parenting can be the greatest, but also the most difficult job in the world. Remember that your kids are developing people. They’re learning and growing and figuring out who they are, what they believe, and how those connect with their actions. When we can remember that in our most difficult parenting situations, it helps us approach these times as teachable moments. This entry was posted on September 11, 2013 by Jennifer Shewmaker in Acting, For Teens and Tweens and tagged parenting, teens.